Okay, friends. Before we go any further, you might want to pop on over to read this link. 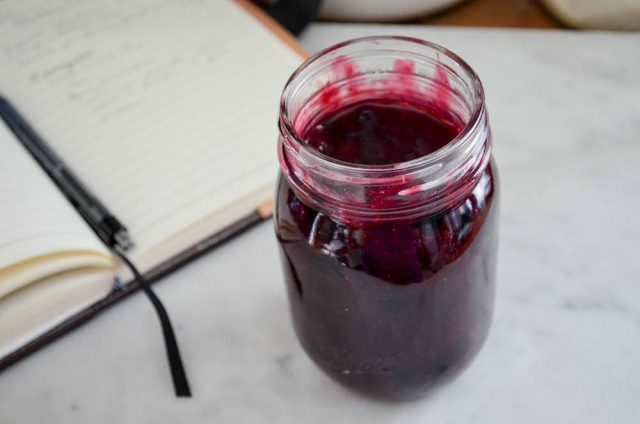 Marisa is the canning guru, and she’ll tell you everything you need to know about hot water canning, which is the method I reference in the first line of this recipe for my Blueberry Pie Filling (“set up a hot water bath”). So, the next thing I should mention is this is the first season I’m making pie filling to store for the long haul. I know, I gasped a little bit at the idea of that, too. Usually I just fill the freezer with more berries than seemingly possible, and work my way through them. This whole year of pie endeavor is what inspired me to finally can filling for long term storage. That, and the fact that I have a wonky freezer, and live in an area susceptible to power outages. The freezer is an easy fix, right? Just buy a new one. Except, I’ve been wanting to do a DIY kitchen renovation, and it’s a much better idea to buy new appliances when (or if?) that project gets going. Speaking of which, have any of you tackled demo’ing cabinets, and putting down new flooring? I’d love to hear your stories or advice. Back to the Blueberry Pie Filling, though. 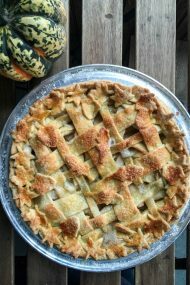 It’s incredible easy to make, and if you don’t want to take on a canning project, go ahead and cook the filling, then add to your favorite crust (um, there are a lot of recipes for crust here). The filling is enough to make two to four pies, depending on if you want smaller ones, or standard 9-inch pies. A word about the cornstarch. I know it seems like a LOT of starch. Feel free to adjust based on how runny you prefer you fruit pies (read: use less cornstarch for a soppy filling). I’m guessing some of you might ask how long to bake it for, yes? Honestly, I don’t have the answer just yet since I usually bake with fresh fruit. I’ll recommended 15 minutes at 425ºF first, because that always helps set the tone for a nice golden crust. Turn it down to 350ºF after that initial bake, and start checking around 30 minutes. The tell tale sign of a done pie is filling gurgling out of the vents on the crust (or lattice if you go that route). Happy pie making! Set up a hot water bath. 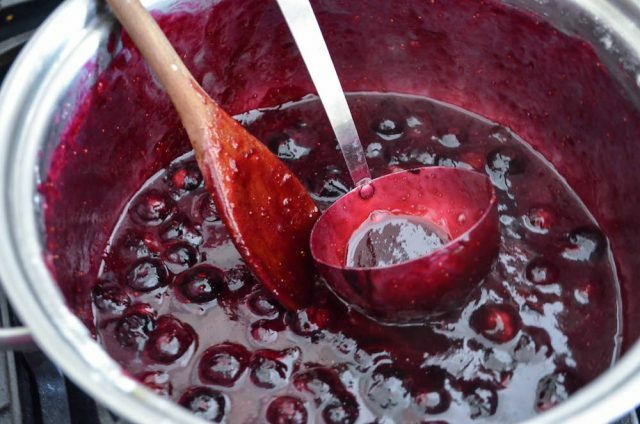 Add the berries, sugar, cornstarch, and lemon juice to a deep pot over medium-high heat. Stir until the berries release some juices. Bring to a boil, then reduce heat to low. Simmer, stirring frequently, until juices thicken, and sugar and cornstarch dissolve completely. OMG! Super excited….wild berries are white right now and plentiful up here this year! Jennie – love reading your blog. 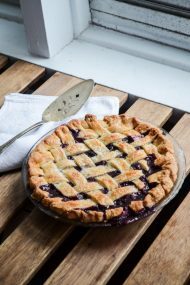 Could the pie filling be made with frozen wild blueberries? If so would I make the recipe the same way? don’t get me wrong, who doesn’t love cake? right? it’s flirty, festive and darn good. BUT, pie…. pie is the stuff. it’s comforting, it’s loving and doesn’t judge you. it’s a slice (ok, no one is looking or counting). I have LOADED my freezer w/the appropriate amount of frozen, seasonally fresh berries, but making my own pie filling? OMG! i’m doing this! no judgement, just the knowledge that they’ll be pie for months in those that really and I mean REALLY need pie. Thank you! i’m having a silly giggle moment… like “i have homemade pie filling and you don’t” blueberries have just hit their stride here in Virginia. I. am. IN. I’d probably use two jars for an 8-inch pie. 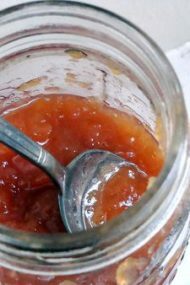 I chose to can smaller jars so I could also have the option of making small pies or hand pies without opening a big jar. Yes, that was a funny comment! Thanks Jennie – I know what I am making this weekend. We have wonderful wild blueberries in northern Ontario. I buy them at our local farmers market. Hi I don’t think the link to the canning tips is working! Could you update please? I have never canned before and would like to learn. (From two days ago) Yes, I thought that was the case. I agree about the smaller jars adding to myriad uses. Yay. would this pie filling be suitable to ladle over cheesecake? I’m not sure you’d want flour in a fruit filling to spread over cheesecake, but you can give it a try if you like.